Posted on Ноябрь 4, 2016 by Татьяна Н.
Чтобы понять, как работают эквиваленты модальных глаголов в разных временах, надо выполнить упражнения. You must work hard on your English. You must learn the words. You must not talk at the lessons. You must not be late. Must I learn this poem by heart? (достаточно редко употребляется, чаще Shall I learn this poem by heart? * Здесь must be — должно быть. Изучить Модальные глаголы в значении предположения. Выражение have to – приходится является эквивалентом глагола must и употребляется вместо него в разных временах. Читать подробнее — Модальные глаголы и их эквиваленты. Упражнение 2. Переведите на русский язык. I have to work late today. She had to stay at home because she did not feel well. Peter will have to stay at home because it will be very cold. Mike had to write this exercise at school because he had not done it at home. They had to call the doctor because the grandmother was ill.
Why did you have to stay at home yesterday? — Because my parents were not at home and I had to look af­ter my little sister. It is Sunday tomorrow, so he won’t have to be at work, but he will have to do a lot at home. I haven’t written my essay, so I will have to write it on Sunday. Why do you have to get up early every day? Will you have to get up early tomorrow? Упражнение 3. Перепишите каждое предложение дважды:в прошедшем и в будущем времени. Заменяйте модальный глагол must его эквивалентом. You must read the text several times. The doctor must examine the child. You must take part in the work. She must go if she doesn’t want to be late. They must get ready for exams. He must do it on time. I must ask my parents. Упражнение 4. Переведите на русский язык. Can you help me in the garden? Can you wait till tomorrow morning? My little sister cannot walk. You can’t smoke in public places. 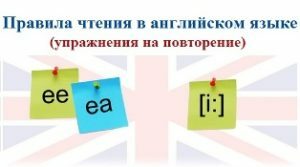 Выражение be able to – быть в состоянии делать (досл.) является эквивалентом глагола can и употребляется вместо него в разных временах. Упражнение 5. Переведите на русский язык. I am able to do it. She will be able to get to the airport in time. He was able to swim the river. They were able to finish the work on time. Will you be able to help me about the house? He isn’t able to buy a new car. They won’t be able to arrange everything by themselves. Упражнение 6. Напишите форму модального глагола CAN или его эквивалента в зависимости от времени. I ________ swim when I was four. Now I _______use a computer very well. I __________to play the piano when I was seven. I __________to drive a car next year. Now I _________not drive a car. Упражнение 7. Напишите форму модального глагола CAN или его эквивалента в предложении в зависимости от времени. He _______ not speak English when he was four. He _____not speak English very well now. I am afraid he __________(not) to go to England next year. She ______(not) to sing now. She is feeling bad. I hope she __________ to sing tomorrow when she is better. Упражнение 8. Напишите форму модального глагола can, could или be able to в зависимости от типа предложения (+,-,?) и времени. What is your favourite sport? — Swimming. I ______swim when I was four. Do you like Maths? — Maths is my worst subject. I ________to do sums (-). I need your help with English. — Ok, ______you _________to come to my place tomorrow? Why did you buy a new computer? — The old computer was very slow. I _________play games on it (-). I think the box is heavy. — No, it’s OK. I _____ carry it. Did you go out on Saturday? — No, I didn’t. I ______go out because I was ill (-). They _______to speak English two years ago. Kate _________to come to the party tomorrow. He is lazy. I think he ______to get a good job (-). She didn’t study hard and ______to enter a university (-). Упражнение 9. Вставьте формы модального глагола CAN. These days many people _________ to buy computers. We ___________use them for work and play. In the past, nobody________beleive stories about robots and space travel, but now computers ___________to walk and talk. They _________to fly to the moon! They __________send messages, write music and speak different languages! In future, they _________to do many different things. Scientists __________to make robots like people but I don’t think computers ______ever _________ to feel emotions. Упражнение 10 (для продолжающих). Перепишите следующие предложения с учетом предложений в скобках. Замените модальный глагол саn (could) выражением to be able to, где это нужно. 1. They can appreciate your kindness. – Они могут оценить твою доброту. 2. He could translate that article. – Он мог перевести эту статью. 4. We can go on to the next exercise. – Мы можем переходить к следующему упражнению. 5. I can give you my book for a couple of days. – Я могу дать тебе книгу на пару дней. 6. We knew that she could swim. – Мы знали, что она умеет плавать. 7. You cannot take part in this competition. – Ты не можешь принять участие в этом соревновании. Упражнение 11. Посмотрите на знаки. Выберите правильный вариант. Упражнение 12. Заполните пропуски. вставьте have to or can’t. Нам часто приходится выполнять инструкции и подчиняться правилам, в этом случае мы говорим «приходится» и «не разрешено». Вот несколько правил поведения в общественных местах. Запомните, что модальные глаголы CAN’T и HAVE TO выражают ОБЩИЕ ПРАВИЛА или ЗАПРЕТ. In a plane you __________ use a mobile phone, you ___________wear a seat belt. At the cinema you ________smoke, you_____________ _switch off your mobile phone. In the library you _______ be quiet, you _________write in the books. In the hospital you ___________use a mobile, you ___________take medicine. 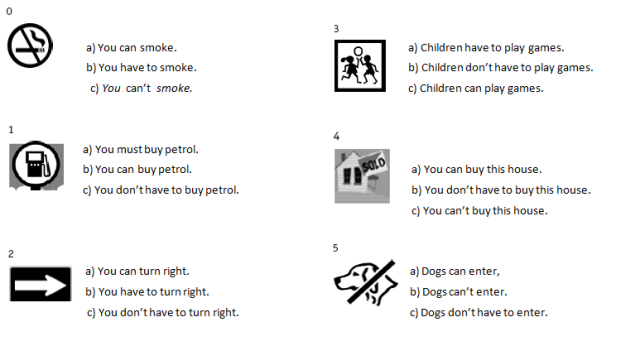 At the petrol station you ____________light a cigarette, you ____________pay for the petrol. Упражнение 13. Переведите на русский язык. May I invite Kate for dinner? You may watch TV after you have done your homework. You may go for a walk after you have washed the dishes. Don’t go alone, you may lose your way. Don’t give the vase to the child, he may break it. It may take a long time. Выражение be allowed to – разрешается делать (досл.) является эквивалентом глагола may и употребляется вместо него в пассивном залоге (Passive Voice). Читать подробнее — Пассивный залог в английском языке. ПРИМЕР. May I buy an ice-cream? – The child asked his mother if he might buy an ice-cream. Упражнение 14. Переведите на русский язык. I am allowed to stay late at night. He is allowed to invite his friends to his place. She isn’t allowed to come home late. They are allowed to have a disco party at school. They are allowed to wear casual clothes at the office. It is not allowed to park cars here. It is not allowed to turn left here. Упражнение 15. Вставьте модальный глагол may (might) или выражение to be allowed to. Вставляйте to be allowed to только в тех случаях, где may (might) употре­бить нельзя. 1. Не … go home if he likes. 2. As soon as the boy … leave the room, he ran out to join his friends outside. 3. The doctor says I am much better. I … get up for a few hours every day. 4. … I bring my sister to the party? 5. He asked if he … bring his sister to the party. 6. After the children had finished their homework, they … watch TV. 7. He … join the sports club as soon as he passes his medical examination (медицинский осмотр). 8. His mother said that everybody… take part in the picnic. 9. If you pass your exams, you … go to the south. 10. … you … to go out in the evening? 11. … I bor­row your car, please? 12. He asked if he … borrow my car. 13…. I have a look at your newspaper? 14. One day all his dreams … come true. 15. … Kate … to have a pet? Упражнение 16. Переведите на русский язык. I need not go to work today. You need not translate this difficult text. You need not do everything by yourself. She need not buy bread. They need not wait for him. Shall I cook the dinner? Упражнение 17. Перефразируйте следующие предложения, употребляя модальный глагол need. ПРИМЕР. It is not necessary to go there. = You need not go there. It is not necessary to take a taxi. It is not necessary to buy the child everything he wants. It is not necessary to get up early on weekends. It is not necessary for you to be present at the meeting. It is not necessary for him to remind me about her birthday. It is not necessary for mother to cook a pie. We can buy a cake. Упражнение 18. Переведите на русский язык. You should apologize if you are wrong. Parents should know how to encourage your child. She should pay attention to his words. He should play less and work more. Parents shouldn’t quarrel in the presence of their child. You shouldn’t drink cold milk if you are ill. They shouldn’t give their child everything he wants. Упражнение 19. Дайте совет, используя модальный глагол should и фразы, данные в скобках. ПРИМЕР. She doesn’t read very well. (to read aloud) — She should read aloud. Упражнение 20 (заключительное). Вставьте модальный глагол, исходя из контекста.